Lamb is a celebrated meat throughout the Mediterranean. Today, we’re doing lamb the Moroccan way! 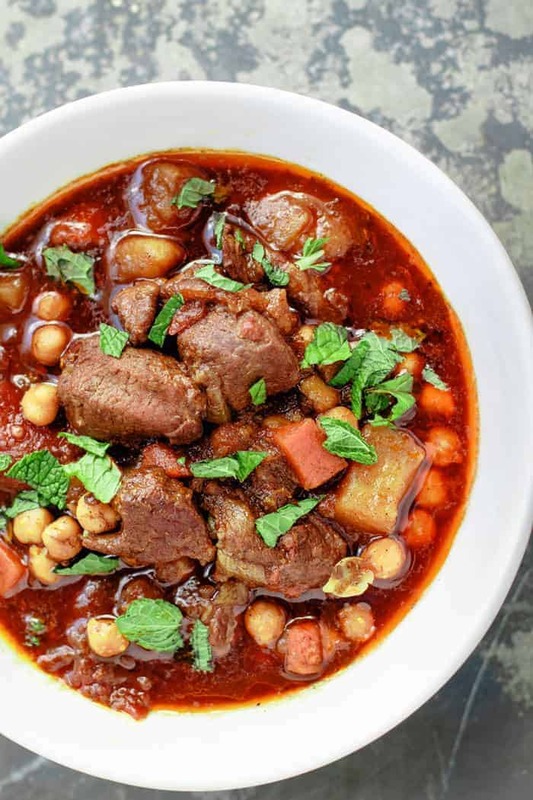 This easy Moroccan lamb stew is perfectly saucy and packs flavor from some amazing spices including Ras El Hanout (find it here), cinnamon, and allspice. Chickpeas and dried apricots complete this hearty stew. Braising and slow-cooker instructions included. And be sure to check out the quick video for how to make this lamb stew. 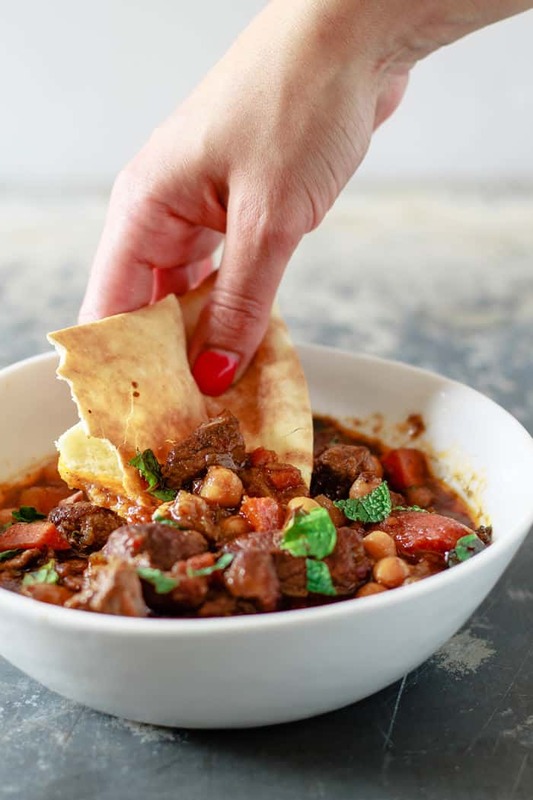 This Moroccan lamb stew recipe is one of those comforting, stress-free meals that are meant to be enjoyed with close friends and family–with oodles of fresh bread for swooping that delicious sauce, of course! Lamb’s unique flavor pairs nicely with intense Moroccan spices and accompaniments like ras el henout, cinnamon, and allspice. Carrots and dried apricots add a balanced sweetness. And to complete this one-pot wonder, I threw in potatoes and chickpeas. Yes, it is every bit as satisfying as it looks! 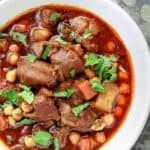 What Cut of Lamb to Use for this Stew? Boneless leg of lamb or lamb shoulder are great choices for this Moroccan lamb stew. Both are relatively cheaper cuts; and coming from the more exercised part of the lamb, they are prime candidates for braising. As the spiced lamb and vegetables cook in the tomato sauce, the moist heat gently breaks the meat’s connective tissue, while all the flavors are released into the cooking liquid. The result, my friends, is nothing short of finger-liking-good! A tender, succulent lamb stew in a sauce full of body and flavor. A crockpot or slow cooker works in this recipe as well (see recipe notes). Honestly, fresh pita bread, or even challah bread, or any bread of your choice is all you need next to this pot of comfort! Or if you prefer, Lebanese rice or plain couscous provide a nice bed for the saucy stew. For starters, I often serve a bright salad like fattoush and these Moroccan carrots. Moroccan-spiced lamb, cooked to tender perfection with carrots, chickpeas and dried apricots. Braising and slow cooker instructions included. In a large Dutch oven or heavy oven-safe pot, heat 2 tbsp olive oil over medium heat until shimmering but not smoking. In the heated oil, saute the onions, carrots, and potatoes for 4 minutes or so. Add the garlic and season with salt and pepper. Remove from the pot and set aside briefly. In the same pot, add more oil if needed, and deeply brown the lamb on all sides. Season with salt and pepper. Turn heat to medium-high and return the sauteed vegetables to the pot. Add the dried apricots, cinnamon stick, bay leaf and spices and stir to coat. Add the plum tomatoes and broth and bring everything to a boil for 5 minutes or so. Cover the pot and place in the 350 degrees F heated-oven for 1 ½ hours (check partway through to add water or broth if needed). Now stir in the chickpeas, cover and return to the oven for another 30 minutes. Remove from the oven and serve hot with your choice of Lebanese rice, couscous, pita bread or your favorite rustic bread. A simple Mediterranean salad like Fattoush makes a great starter for this hearty meal. Enjoy! Slow-Cooker Instructions: If you prefer, after step #5 is completed, transfer the lamb stew to a large slow cooker insert. Cover and cook on high for 3 to 4 hours, or on low for 5 to 6 hours. Recommended for this Recipe: all-natural Ras El Hanout spice blend and ground allspice. SAVE! Create your own 6-pack from our all-natural and organic spice collections. Have you tried our Greek olive oils yet? Exquisite olive oils from organically grown and processed Koroneiki olives, straight from family owned groves in Greece! I used Private Reserve EVOO in this recipe. See our EVOO Bundle here. Can you use frozen lamb? If so, do you still Brown the meat? Hi Faith. If you thaw the lamb properly, you should be able to use it. I’d still follow the recipe as instructed. Wonderful stew , very tasty recipe. Thanks! Daniela, I am so so honored to hear this. Thank you so much for sharing!!! This was just too delicious! I am making this again! I made this dish today. There is only one word to describe it — DELICIOUS. I have a brand new Emile Henry Tagine, can I use it to make this stew? Delicious and satisfying! A few tweaks – did not have ras el hanout and used fewer potatoes but came out really well. Served over rice. My husband and I really enjoyed it. I have just recently discovered this website and these are the recipes I have been looking for. Made several already. So healthy. Thank you! Awesome! Thanks so much for checking this one out, Norma! This looks good, except you don’t eat pita bread with Moroccan food. Karsten, over here, we eat pita with just about any kind of food 🙂 On a more serious note, Shakshuka is fairly popular throughout the Middle East as well, and there, pita is the natural choice. Whatever the choice, shakshuka is a winning dish. I made this last night with a couple of small variations. I added some rainbow carrots that needed using up and a cubes eggplant. I did not have any canned plum tomatoes (never use them), so I used half a can of tomatoe paste with a couple of fresh, diced tomatoes. And finally, I did not have any Ras el Hanout, so I used a teaspoon of curry seasoning in addition to the other spices in the recipe. It was delicious, and even the kids loved it. It paired really well with rice pilaf. This recipe is definitely a keeper, and I can’t wait to try it with the Ras El Hanout. Laurie, thank you for sharing your variation! I love to hear all the ideas. So glad you enjoyed it. This was a really delicious stew, and easy enough for a weeknight. I converted it to an Instant Pot recipe with good results. I reduced the broth to one cup and cooked on high for a half hour. Oooh, so glad you shared your Instant Pot variation. I am going to try that sometime! This recipe looks amazing, Lamb is my most favourite meat but sadly my husband (who doesn’t know what’s good for him) won’t eat it. I think it’s time for a pork chop for him while I delve into a delicious lamb stew., I know which of us will have the better meal. Many thanks for sharing the recipe. Hiya, this recipe looks delicious. Just a couple of questions, what can I substitute for the spice ras el hanout and secondly do I use 6 cans of tomatoes or just six tomatoes out of a can? Sounds a bit silly but I’m a novice and I can’t quite figure it out! Hi Sam, there is not a direct substitute for Ras El Hanout, however, in this recipe, a little cumin and a smaller bit of turmeric will be good. And you only need 6 plum tomatoes out of a can (not 6 cans). Enjoy! I can’t say I have tried it in a pressure cooker, but I’ll bet it will work wonderfully. I’d just use the pressure cooker guide for stews. Amazinggggg!! So tasteful. Will definitely cook it again soon. Yay! So glad you enjoyed it! Thanks for sharing!